The labor room is one of the most versatile rooms in a hospital. It is called a labor, delivery, and recovery room (LDR). This is the type of room that some hospitals and almost all birth centers use for their care. Once you are placed in a room, this is the room that you will use for your labor and birth, including the initial hours of recovery. The LDR is designed for nearly all births. It can handle a birth for women choosing to go unmedicated or those who wish to have an epidural. The vast majority of these rooms can also handle minor emergencies and procedures including forceps and vacuum deliveries. 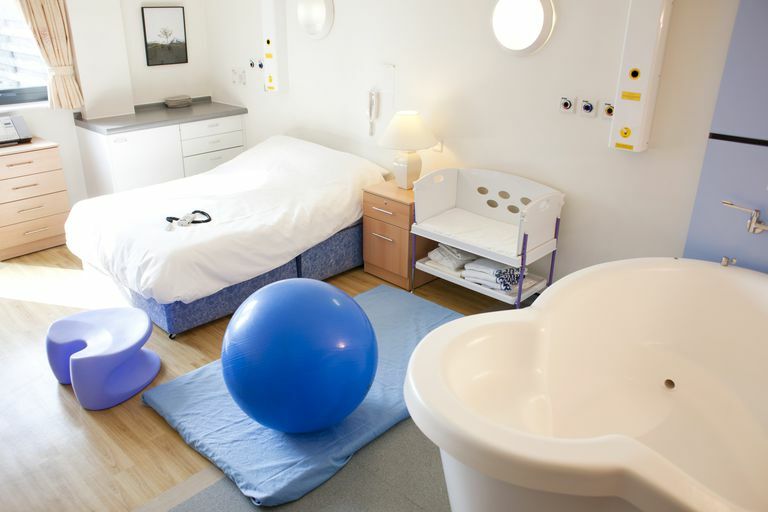 You would only need to leave this room if you needed to go to the operating room for a cesarean or the high potential of a cesarean (such as in the cases of twin births or a vaginal breech birth attempt). Once the baby is born, there is equipment in the room to handle newborn care as well. While the immediate care of the newborn is best-handled skin to skin with the mother, if there were an emergency or the need for specialized equipment, the average LDR room is prepared with a warmer for the baby and life-saving resuscitation equipment. You will stay in this room the first hour or two after you give birth, then you are transferred to the postpartum floor. Some facilities also offer what is called a Labor, Delivery, Recovery, and Postpartum (LDRP) room. In the LDRP, you will give birth here and your baby will stay with you until you are ready to go home. Many of these facilities use the nursery only for babies or mothers who are very ill, rather than well newborn care. As with the LDR, the LDRP is equipped to handle only vaginal births. Though you can have an epidural or other pain medication in this room if they are available at your place of birth. And, if you are in a hospital and require it, you can also have a forceps or vacuum delivery in the vast majority of LDR rooms. If you require a c-section at the hospital, you will generally not recover in the LDR, even if you labored in one. This may depend on space and the number of people on shift. When you take your hospital tour before you give birth, be sure to ask about the rooms where you will give birth. Your hospital may also have a combination of rooms, meaning some people will get a special room and others won't. This may be first-come-first-served or it may be by special request. An example might be that your hospital only has a few rooms equipped to handle a water birth. This means that they may decide who gets to go to which room based on a number of factors including people who expressed interest earlier in pre-registration. Sometimes it's based on who has taken certain classes at the hospital or other factors. You should ask what is in each room and what you should consider bringing for comfort. An example might be a regular or peanut birth ball. Bailey SJ, Howe JK. Nurs Manage. 1993 Dec;24(12):42-6. High-volume obstetrics in a combined LDR/LDRP program. Koska MT. Hospitals. 1988 Oct 5;62(19):60-1. One-stop LDRP (labor/delivery/recovery/postpartum) units redefine obstetrics care.